When you combine Old South traditions like carriage rides, riverside picnics, and down-home cooking with the New South vibe of farm-to-market eateries, art tours, and rooftop craft cocktail lounges, you have one of the hottest destinations in the southeast. 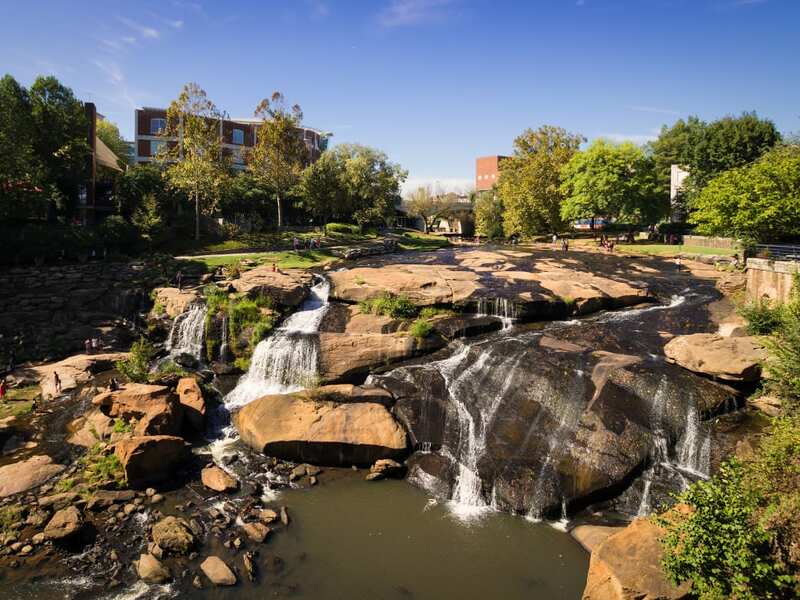 Greenville, South Carolina, packs more than 100 restaurants, eclectic locally-owned shops, and 20 miles of greenways in and around a charming and historic Main Street. 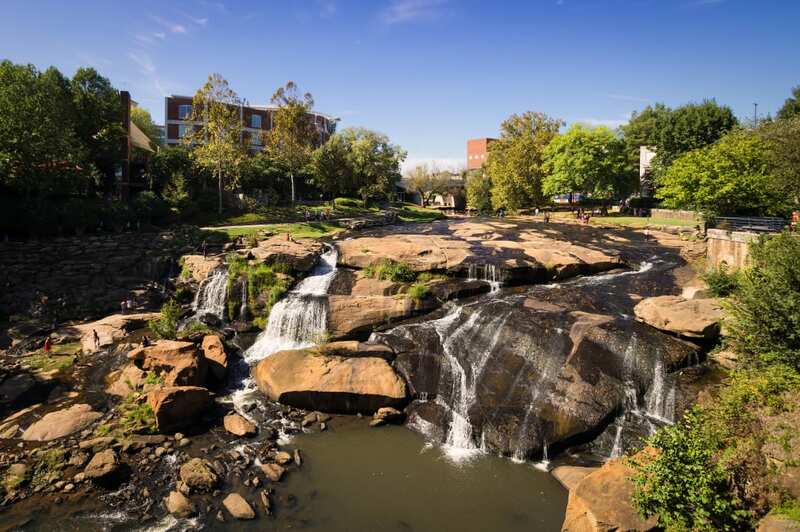 In downtown Greenville, you can enjoy a weekend of relaxation, outdoor recreation, family fun, and everything in between. You’d never know it today, but just a few decades ago, Greenville’s iconic Falls Park on the Reedy was an overgrown plot of land beneath a four-lane overpass. The 28-foot waterfall that anchors the park was sometimes tinted the color of the dyes used in cotton mills lining the Reedy River. Downtown revitalization efforts that started in the 1970s have preserved Greenville’s mill town roots, creating a shopping and dining destination around them. Historic brick mills have become trendy riverfront restaurants, and the iconic Liberty Bridge sits suspended above picnickers, runners, and cyclists enjoying Falls Park below. To make the most of your time in the park, stop by specialty market Caviar & Bananas to fill a picnic basket with gourmet sandwiches, salads, and your favorite wine or beer. Spread your blanket by the river and watch ducks float by, or take in one of the city’s many festivals and events, like Shakespeare in the Park, Artisphere, or the Fall for Greenville food festival. Most bars and restaurants offer water bowls, treats, and a comfy spot for your pup to hang out while you dine. Complimentary pet pick-up stations are everywhere, and there are a number of pet-friendly hotels to choose from. For the ultimate in canine pampering, book a room at the Noble Dog Hotel. This five-star luxury pet resort offers blueberry facials, pumpkin pancakes served up by the hotel chef, and so much playtime that your pup won’t have a spare moment to miss you. Make the most of your morning with an early run followed by brunch at one of Greenville’s many patio restaurants. 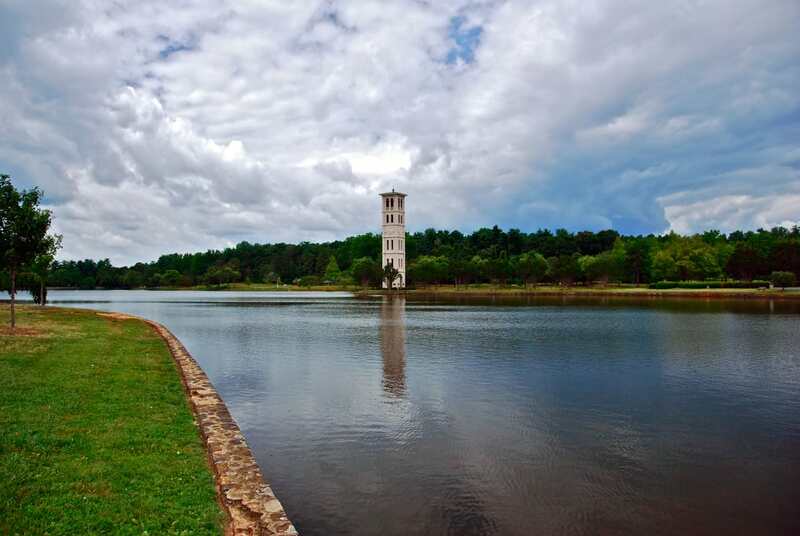 It’s easy to get lost in the moment on 13 miles of pathways through Furman University’s lush campus, just off the Swamp Rabbit Trail north of downtown. Or, run the paths of the new Cancer Survivors Park, a serene oasis of reflection and rejuvenation open to the general public and designed for anyone whose life has been touched by cancer. For brunch, a French twist on Southern cuisine is waiting for you at Passerelle Bistro overlooking Falls Park. Jianna serves modern Italian and freshly-shucked oysters with a second floor view of the park and Main Street from their indoor/outdoor bar. Tupelo Honey and Roost are also downtown staples for the weekend brunch crowd. Greenville’s Art in Public Places program showcases more than 70 works from world-class sculptors, from thought-provoking (Tuan’s "Meditation") to historic (sculpture of former Greenville Mayor Max Heller) to elegant (Chihuly’s “Rose Crystal Tower”). It’s all free and accessible to anyone, any time. Wrap up your tour at the Greenville County Museum of Art, also free and home to the largest collection of Andrew Wyeth watercolor paintings in existence. Families can embark on a scavenger hunt for Mice on Main. Nine bronze mice sculptures, inspired by bedtime story "Goodnight Moon," are tucked away in not-so-secret places along Main Street, requiring a morning’s worth of detective work to find them all. 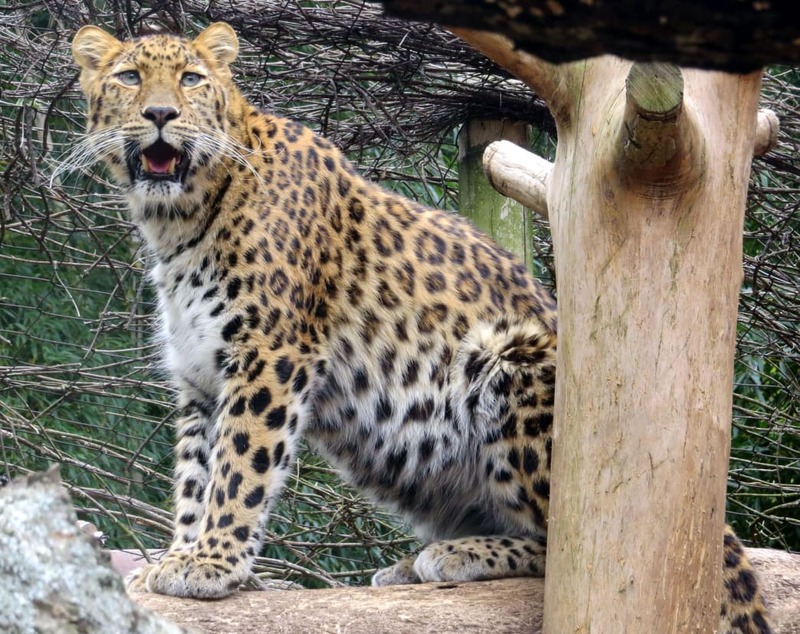 Ride the free trolley to the Greenville Zoo, and then check out three floors of hands-on science exhibits at The Children’s Museum of the Upstate. If the kids aren’t worn out after that, Falls Park is full of splash-friendly fountains, and you can end your day with a baseball game at the Greenville Drive’s downtown stadium. Pick up a bike at any B-Cycle station or local bike shop and hop on the Swamp Rabbit Trail in Falls Park for 20-plus miles of cycling on a paved greenway stretching all the way north to Travelers Rest. Eat downtown before you ride, or stop by Hampton Station’s Birds Fly South Brewery or White Duck Taco for a bite. You can even make it a biathlon of sorts by combining your pedaling with axe-throwing at Craft Axe. Travelers Rest is the end of the road, with more than a dozen restaurants, Copperhead Mountain Distillery, and Swamp Rabbit Brewery and Taproom. If your little ones are only up for a short ride, bike to the Swamp Rabbit Cafe & Grocery, 2 miles outside downtown for farm-fresh food that’s sourced from more than 100 local growers. The kids will love their huge playground. Every Saturday morning from May through October, the TD Saturday Market takes over two city blocks, and a Saturday afternoon or twilight tour with The Brewery Experience takes you to three of Greenville’s most unique craft breweries. If spirits are more your thing, downtown’s Dark Corner Distillery serves samplers of their classic moonshine and gin, flavored shine, and Whiskey Girl in tempting flavors like butterscotch and honeysuckle. There’s no better way to get to know a destination than through food, and the Greenville History Tour breakfast, barbecue, and chef’s table tours give you that behind-the-scenes access. Be sure to make a reservation at Husk, where the James Beard Award-winning chef elevates Southern cuisine to an art form.